Pakistan’s military feels that it has created unity of command in 2018 without a military coup. Pakistan ends 2018 with a sharply devalued rupee, greater dependence on foreign largesse, lower credit rating, and even less democracy than before. The year witnessed the imprisonment of a former prime minister and the selection of a new one – Imran Khan – hailed as the country’s saviour by some and seen as an inexperienced and dimwitted demagogue by others. The turbulence in Pakistan’s politics began well before 2018 and will probably continue for years to come. But this was the year when the all-powerful military stopped pretending that elected civilians run the country’s affairs. Everybody knows that the military has been Pakistan’s most powerful institution since 1951. But after the collapse of the military regime headed by General Pervez Musharraf in 2008, it was assumed that the generals had learnt their lesson. Instead of assuming power directly, they seemed willing to share responsibility for running the country with elected politicians. The politicians pushed for greater control over policy-making in the last decade. The 18th amendment to Pakistan’s constitution enhanced the authority of the provinces, giving them greater control over economic resources. There was deference to the military’s concerns in foreign policy and matters pertaining to national security. But the two generals succeeding Musharraf as chief of army staff went to great lengths to keep up appearances of constitutional governance and civilian rule. Many around the world bought into the idea of gradual democratisation of Pakistan. All that changed once the current army chief, General Qamar Bajwa, threw down the gauntlet to Prime Minister Nawaz Sharif. Bajwa was not content with a personality cult for himself, like the one General Raheel Sharif had built. Nor did he focus solely on getting an extension in his three-year tenure, as General Ashfaq Kayani had preferred, although he still has another year in office and might seek that coveted extension. “The military and the civilian government are on one page” is the new mantra in Pakistan. The courts, especially the Supreme Court headed by Justice Saqib Nisar, seems to give judgments dictated by the military and any judge who does not toe the line is sidelined or removed. The media is tightly controlled and the general heading Inter-Services Public Relations (ISPR) is the virtual czar over the flow of information to Pakistan’s citizens. After installing Imran Khan as the Prime Minister through an election that did not offer a level playing field to his rivals, the military has reverted Pakistan to where it was before the 2008 election that resulted in Musharraf’s removal from office. It is interesting that many of Khan’s ministers and close advisers are all individuals who held government positions under Musharraf. From the generals’ point of view, things could not be better. They have an ostensibly civilian government in place, which can get the blame for Pakistan’s myriad problems, while the generals run the government. Who needs the title of president or chief martial law administrator (CMLA) when you can act as a ventriloquist and get the president, prime minister, and cabinet ministers to say and do exactly what you want? The Pakistani military, like all militaries, is motivated by patriotism and its plan for effectively remaining in charge stems from several wrong assumptions. It assumes that diverse opinions and policy prescriptions are damaging for Pakistan; that politicians and independent thinking civilians are untrustworthy and lacking in national spirit; and that learning from the past means determining whom to blame rather than figuring out what those mistakes might have been. That is why there has been a remarkable consistency in the core beliefs and thoughts of Pakistan’s top military commanders. 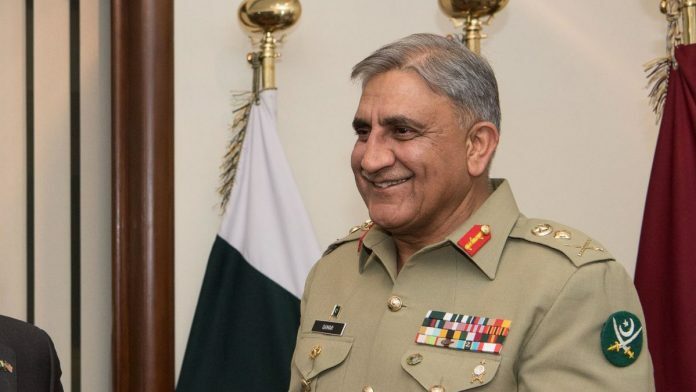 General Bajwa ended the year with the proclamation that Pakistan was the target of “a hybrid campaign”, in which “our own people” are major protagonists. “Mostly misguided by ambitions, blinded by hate, ethnicity or religion or simply overawed by social media onslaught, some of our own boys and girls readily fall victim to such dangerous or hostile narratives,” he declared, implying that having a single narrative was all that was needed to protect Pakistan. This way of thinking assumes that the normal exchange of ideas in a democracy is undesirable and is not unique to Bajwa. Pakistan’s first military ruler, Field Marshal Ayub Khan, spoke in a similar vein and most army chiefs since then have insisted on shutting down debate about what really ails Pakistan. While the military leadership waged war against alternative narratives, Pakistan was put on the grey list of the UN’s Financial Action Task Force (FATF) that deals with money laundering and terrorist financing. Pakistan also ended up on the United States’ ‘countries of concern’ list in relation to religious freedom. Dealing with internationally designated terrorist groups or protecting religious minorities simply do not feature among concerns of those who rule Pakistan, even if Imran Khan says it does. The country’s low ranking in most international indicators – its low literacy (which fell by 2 per cent over the last four years) and poor human capital – also are issues that get little mention and even less attention in the national discourse. In international relations, deteriorating ties with the United States and India were put down to those countries’ arrogance. In the view from Islamabad, there is smugness about the ‘all-weather friendship’ with China coupled with the assumption that Pakistan’s strategic location makes it so important that some combination of powers would always be available as the country’s allies. But the state of the economy is definitely a cause for anxiety. 2018 ended with the State Bank of Pakistan lowering its forecast for economic growth from 5.8 per cent to 4 per cent. The Pakistan rupee went through considerable devaluation during the year, foreign exchange reserves declined to precarious levels, and the stock market did not have a good year. Pakistan found itself at the doorstep of the International Monetary Fund (IMF) for its 13th bailout since the 1980s, with most analysts predicting that it would come with tough conditions. Khan approached Pakistan’s few remaining friends in the international community –China, Saudi Arabia, and the United Arab Emirates (UAE) – for loans and deposits to stave off a budgetary and foreign-exchange crisis. The Saudis promised $3 billion in the form of a deposit with the State Bank, of which $1 billion has been a delivered. The UAE promised another $3 billion deposit with the central bank. Saudi Arabia also announced that Pakistan would be allowed to defer payments on $3 billion of oil purchases for one year to preserve foreign exchange reserves. Negotiations with China for additional funds continued through the end of the year. The Saudi and UAE deposits in the State Bank are short-term loans and at the end of the day, Pakistan needs to expand exports and increase remittances from overseas Pakistanis. There is no sign that exports would rise without a restructuring of the economy and growth in remittances was also flat. There was no understanding among the men who rule Pakistan that economic performance is often linked to political stability and predictability as well as all the other things –like higher literacy, quality of education, human capital, openness to new ideas, social trust, ease of travel – that they do not wish to discuss. With judicial manipulation, election interference, jailing and enforced disappearances of opponents, and a clampdown on the media, Pakistan’s military feels it has created unity of command in 2018 without a military coup. The generals and civilian ministers are said to be on the same page. In 2019, we will find out whether the writing on that page will lead to a better outcome for Pakistan and Pakistanis than has been their fate for the several decades of military ascendancy. Husain Haqqani, director for South and Central Asia at the Hudson Institute in Washington D.C., was Pakistan’s ambassador to the United States from 2008-11. His latest book is ‘Reimagining Pakistan. one of the few pakistanis with the courage to tell the truth. A person who recieve dictations from other has an empty mind and is known as puppet. He damaged Pakistan more than the Army did in the last 61 yrs, once he was an ambassador. He is a polition not an analyst. The Print should also consider that their articiles should be based on facts or analysis and not just political motivated wrtings. HH, you should be ashamed of your self. You have no integrity. It’s so very unfortunate that we let you represent Pakistan. We didn’t knew about your character. Good that we know you now. Writer is himself a chipmonk of Asif ali zardari, he cannot fool all the people all the time..
Not a credible person will write anything if paid appropriately. Not worth reading and yet you read.